and "Its all about the Insulin, baby." It's true! 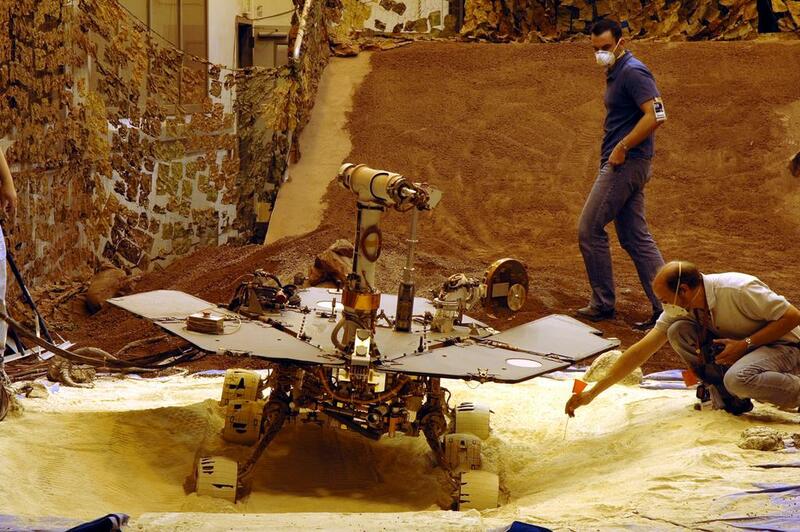 Robots sent from Earth have landed on the Red Planet! Okay, old news. But it's still pretty remarkable. And, considering that no individual knows how to get the job done--it takes governments, partnerships and big contracts--it's hardly surprising that things don't always go to plan on the Martian surface. The same goes for spacecraft orbiting Mars. Here are a few recent hiccoughs. Ever gotten stuck driving in snow or mud? That's nothing. Since late April, NASA's Opportunity rover has had its wheels stuck in a soft, slippery Martian sand dune with a texture something like ground-up clay mixed with chalk dust. Because it takes up to 20 minutes to send signals between Earth and Mars, Opportunity must risk driving on its own by executing predetermined sets of instructions. While executing its most recent trip instructions, some of the rover's wheels buried themselves in the dune and kept spinning and digging in until the rover 'thought' it had reached its destination some 50 meters farther off. Since this Martian sand is so slippery and the rover weighs so little in Mars' gravity, spinning the wheels quickly or rocking the rover back and forth won't help, the way they might help terrestrial off-roaders. Rather, in tests at the Jet Propulsion Laboratory, rover engineers have determined that the best approach to maximizing traction will be to spin the rover's wheels very slowly and patiently over the course of several days. NASA will try in a week or two and if that doesn't work, they'll give up and call AAA. Ever had trouble with an erection? The ESA's Mars Express satellite has. Last Wednesday, ESA controllers in Germany instructed the Martian satellite to extend the first of two 20-meter radar antennae. By Saturday, 12 of the antenna's 13 segments had locked into position, but one segment remained under-extended and will probably remain that way for the life of the probe. Erect or not, the antenna is apparently still capable of collecting data and so won't derail the MARSIS project, which aims to map water and ice deposits in Mars' crust. Deployments of the mission critical second antenna and a third, shorter antenna have been delayed until engineers examine possible causes and ramifications of the malfunction. Antenna deployment had already been delayed since April, 2004 over concerns that the antennae might collide with the probe's body and damage it. That could have been a real turnoff. Ever drop something really expensive? In 1999, NASA dropped its Mars Polar Lander on the Martian surface and broke it. Now, aided by recent success in spotting the Spirit and Opportunity rovers, planetary scientist Michael Malin seems to have found the Polar Lander's wreckage. Taking a better-informed look at pictures from just after the crash, he has found suspicious blobs that look like a parachute and a blast zone left by the lander's descent rockets. As soon as this June, NASA will use the Mars Global Surveyor and a fancy new imaging technique to take higher-resolution pictures of the blobs in question. With luck, the new images will confirm a NASA review board's best guess that the lander's descent rockets cut out early, causing a fatal plummet. Since the Polar Lander was born during NASA's dubious "faster, better, cheaper" phase, it didn't radio home much information about what exactly was going on during the crash. Thus, so far, best guesses have been all NASA can muster about the lander's mishap. Not only does it take a lot of cooperation to put robots on and around Mars, it takes a lot of money. The Spirit and Opportunity rovers have cost about $850 million as a pair. Mars Express cost about €300 million. The Mars Polar Lander was a waste of about $120 million, unless you grant that engineers learn a lot from their mistakes. All that money makes space exploration tense: on one hand, maybe we should spend it on our own planet solving more pressing problems. On the other hand, space exploration is a legit science. And since it's really hard to guide robots through far away, unknown places, expensive mistakes are part of the process. That's also true in real life. Diabetes is a hot issue these days, as chubby teens and grownups alike acquire it at a record rate due to unhealthily high consumption of sugars. This adult onset diabetes, also called Type II, is on its way to becoming a key battalion in the army of diseases spurned by the Obesity Epidemic. But if there is a Type II, must there not be a Type I? Indeed, the first flavor is responsible for the actions of your friend in elementary school, who had to prick his finger before eating and also wore that cool bracelet with the snake climbing up the pole. Commonly referred to as juvenile diabetes, Type I is conferred by a genetic predisposition to the disease. In Type I, not enough insulin is produced whereas Type II is caused by Insulin resistance from excessive levels of Insulin in the blood. Insulin is a key metabolic hormone released from the pancreas in response to sugar levels in the blood. After the hormone is let loose, it travels to tissues throughout the body and tells them to switch to sugar storage mode, metabolizing sugar into other molecules like fat and glycogen. Researchers have recently discovered that the Insulin deficiency associated with Type I diabetes may be caused by an immune response against Insulin itself. The root of Type I diabetes is at the level of immune system T-cells, which misidentify Insulin producing cells as foreign invaders and mark them for destruction. Scientists from the University of Colorado Health Sciences Center used genetically modified mice to determine that removing the section of the Insulin protein recognized by T-cells caused diabetes-prone mice to not develop the disease. The finding suggest that the Insulin hormone is the key player in a case of mistaken identity, leading the immune system to attack insulin producing cells, resulting in juvenile diabetes. If Prodigy of the seminal rap group Mobb Deep had been a diabetic, he may have altered his famous line from the classic track Survival of the Fittest: "There's a war goin' on inside no man is safe from this Insulin that we done cooked." Droppin' science for real.